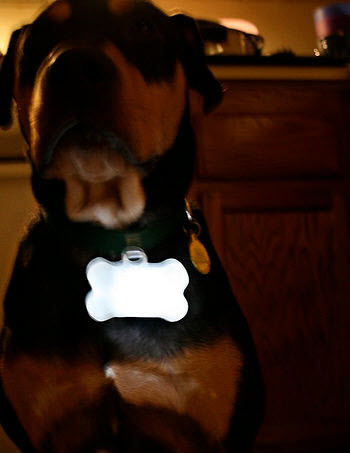 Keep your dog safe on night walks with a glowing light on their collar! Wire an LED light to a battery that has a switch, then wrap the whole thing with tin foil. Get a plastic bone-shaped dog bag dispenser, make a mold of the dispenser, then use the mold to make a resin case. Attach the electronics in the case with Velcro, then glue a snap tag holder onto the battery.